‘If it tastes good, cram it in’… South African street food hits London at the newly opened Bunny Chow on Wardour Street. 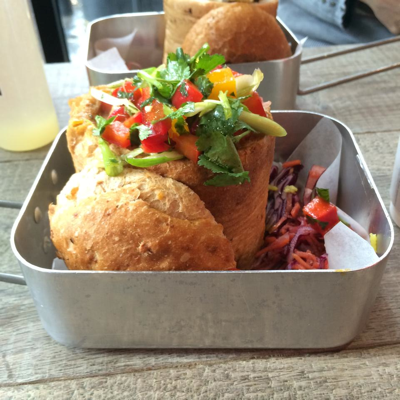 Bunny Chow is a new South African-inspired cafe on Wardour Street in Soho. 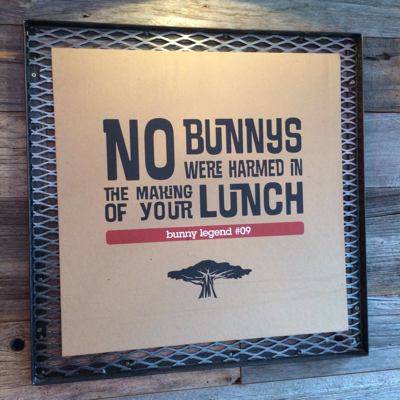 It seems named to deter passing vegetarians from entering – until you learn that a bunny is not a popular childhood pet, but a type of fast food. Popularised in Durban by the Indian community, a bunny is a small loaf of bread that has been hollowed out and filled with a hot filling. It’s impressive looking food. Served individually in mess tins there is a definite just-caught-and-cooked-my-own-lunch vibe to the meals, eaten at communal wooden tables in the striped down, pale, pun-postered room. The bread can be brioche, wholemeal, white or gluten free – you choose. Crispy and crunchy on the outside, the inside necessarily gains the texture of a medieval knight’s bread platter. Some find this crunchy-soggy dichotomy enjoyable, indeed it is one of the defining characteristic of the bunny. Personally I am encouraged to eat quickly enough that the bread doesn’t become too saturated. Unable to see what is inside the loaf, it is an exciting voyage of discovery down the bunny. There was rice at the base of my Piri Piri Pork Bunny, stuffed with spicy, pulled pork and fresh salad. Other possible fillings are the authentic slow cooked mutton curry (the Durban), the Chakalaka with spicy chicken and the Veggie. There’s also a Full English, which is precisely what it sounds like and – for Easter – a special sweet edition with the best name of the lot – the Hot Cross Bunny. This is made from a hollowed out raisin soaked bun with orange rind, with either raspberry jam or warm chocolate filling and a hearty dollop of clotted cream. I am told South Africans pick up a bunny and eat it like a sandwich. For those not keen to get covered in sauce there are plastic knives and forks, but at some point you will probably give in and pick up the remains of the loaf in your fingers. It’s like eating stew without cutlery, which is a strange sensation and worth experiencing. Bunny Chow also makes its own juice mixes, of which the brightly coloured Madibas with grapefruit juice, blueberries, raspberries and strawberries is an enlivening choice. North Beach with coco cream, coco water, banana, lime and lemon tastes like a non-alcoholic cocktail. In fact you can liven your meal up by adding a shot of the hard stuff to your drink. Sides and snacks are also available. I tried the piri piri popcorn which had been popped in lamb dripping. This gives a meaty undertone which I’ll be avoiding but other options include borecole (stir fried kale), chilli biltong and chilli and garlic scratchings. Available to eat in, take away or have delivered Bunny Chow is an exciting new addition to the lunchtime fast food scene in central London. It will probably never overtake fish and chips in your heart, but is a fun alternative to the ubiquitous sarnie.